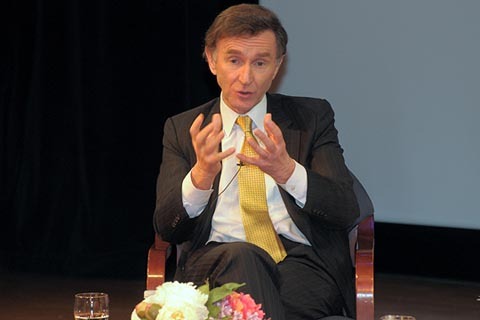 NEW YORK, February 17, 2010 - "Asia is re-taking its place on the world stage" in this century, which will require fundamental changes in the global macro-economy and global political relationships, according to HSBC Bank Chairman Stephen Green. Discussing his new book Good Value: Reflections on Money, Morality and an Uncertain World with Asia Society President Vishakha Desai at the Asia Society's New York Center, Green declared, "The whole center of gravity of the world is shifting from West to East." Green said that globalization has increasingly become a reality of human experience—which, in his view, has created a need for the economy to accommodate the billions of people "who perfectly reasonably aspire to the standards of living" enjoyed by the world's developed countries. Ensuring a shift to lower carbon-emitting technologies for the sake of sustainable development will eventually force countries to work together, in Green's view. Green characterized market fundamentalism as an outdated ideology that actually devalues the integral purpose of commerce, which he defined as the exchange of mutually beneficial goods and services. Shareholder value, he continued, is a byproduct of the fundamental job of creating and selling profitable products. Green saw market fundamentalism's core tenet of self-policing markets as having been thoroughly discredited. Instead, as he put it, "complex modern economies and markets" need a "fairly extensive and carefully calibrated" government involvement in their functioning. Turning to the current economic crisis, Green said that "the breakdown in public trust and confidence in business in general and banks in particular" had created the need for a new look at the fundamental values and objectives that motivate business. In his view, corporate social responsibility should be regarded as a core component, the "raison d'être" of a company, rather than as merely an adjunct to its "real business." In the subsequent audience Q & A, Green, an ordained minister in the Church of England, fielded a question about how he balanced his professional life with his personal beliefs. Green replied that while he did agree that "one cannot serve both God and mammon (money)," he didn't equate "working with money as worshipping or serving the money." When the topic veered towards Wall Street and the "demonization of bankers," Green mounted a spirited defense of the many decent and hardworking people he believes to be working in the financial sector. Speculating on a way forward for government regulation of markets and the taxation of bankers' bonuses, Green argued that regulation alone can never be sufficient; in the wake of the crisis, both regulatory and institutional reform were required. He characterized 2009 as a year of transition for the world economy and said that 2010 needed to be the year where developed (G7) and developing (G20) countries together find a new consensus to "pave the way forward for a stabler market for the next generation." Good Value: Reflections on Money, Morality and an Uncertain World is available from AsiaStore.